Help children identify their feelings and choose helpful personalized calming strategies and solutions. The I Choose Self-Control Board can be used to increase self-regulation in any setting, and is an essential tool for the Conscious Discipline Safe Place. Place theI Choose Self-Control Board in your Safe Place. It provides eight images of different feelings, a mirror to help children identify what they are feeling and strategies to help change an upset inner state to a calm one. Children select the feeling that represents their inner state, and then choose the strategies they will use to self-regulate. Children who experience difficulty with self-regulation may benefit from having a personal I Choose Board available at their desks throughout the day. These students require extra connection from you (in the form of I Love You Rituals and other one-on-one activities), plus additional guided practice with the I Choose Board and other Safe Place tools. 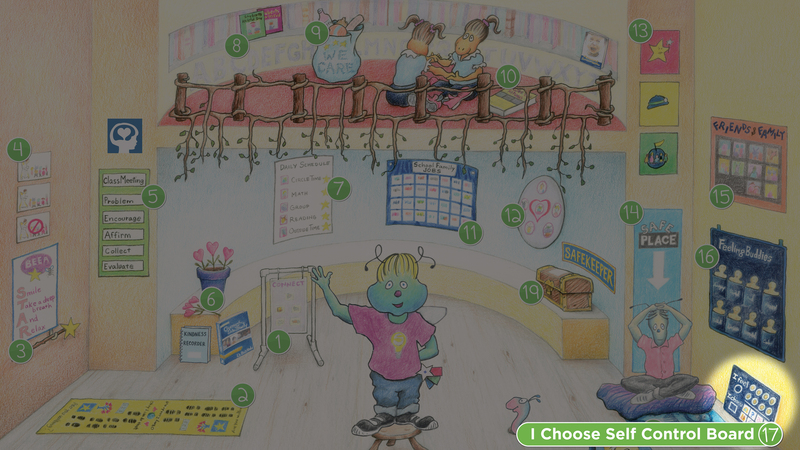 In older classrooms, the I Choose Board can also be used as a mobile Safe Place to take along when the class goes to an assembly, field trip or other activity that takes the students away from their classroom Safe Place.